MACON, GA- The Macon Mayhem and Director of Hockey Operations Kevin Kerr announced Tuesday that the team has signed forward Kevin Irwin to a contract. Irwin, 24, signed a three-game tryout with the Mayhem on February 21st and scored his first career professional goal in his first game with the team. He played two of the three games on his three-game tryout - tallying the one goal, and he was released from his three-game tryout on March 1st. 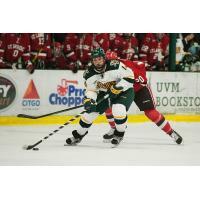 The Hinckly, Ohio native played three seasons of NCAA Division I hockey at the University of Vermont prior to turning pro, and in 71 games, he tallied nine goals, 19 assists and 28 points. He spent four seasons between the Green Bay Gamblers and the Des Moines Buccaneers in the United States Hockey League (USHL), recording 60 goals, 41 assists and 101 points in 202 games. The Mayhem head to Roanoke to take on the Rail Yard Dawgs on Thursday and Friday. They are back home on March 31st for Pucks-N-Paws Night and Wiener Dogs Races. For ticket information, visit MaconMayhem.com or call the Mayhem Front Office at (478) 803-1592.